This enclosure supports 6 circuits. 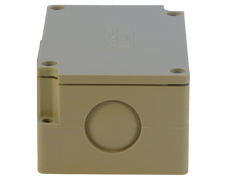 The terminal is rated for AC 120V / 60Hz / 15A, according to UL508A:2005. Manufactured from V0 Rated ABS plastic. Easy installation with molded knockouts (13/16 in/21mm) on both ends allowing for the use of wire glands or wire clamps with a standard 1/2 NPT thread. 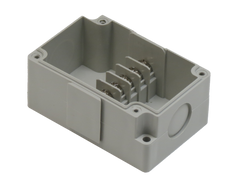 Each screw clamp on the terminal has a connection capacity of 14 - 20 AWG (0.5 - 2.5 mm2). Safety certified by TUV SUD NRTL to UL Specification UL508A:2005. Degree of Protection Against Ingress of Liquids: IP20. 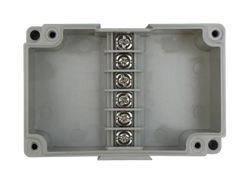 IP65 rated, dependent on proper installation with IP65 rated connectors. Manufactured by SegiBiz CO., LTD.